Given the leisure time of college life in the 1950’s, students on Ivy League campuses adapted the ancient game to their main Quads with the precursor to the Frisbee: the Pluto Platter. Just like ball-golf, the goal was to put the object into the target area in the fewest amount of “strokes,” usually with an initial drive, an approach shot(s), and putting for completion. These informal courses singled out lamp posts and trash cans from one hole to the next and the score was kept based on the agreed-upon par set for each hole: 3, 4, or 5. Permanent courses where players could reliably compare scores did not exist until 1975 when “Steady” Ed Headrick invented the modern disc golf basket (pole-hole) and installed the first course in Pasadena, CA. His ingenious invention kills the flight-path of a disc in a hanging array of chains that converge on a ring-around-a-pole in parabolic arcs, allowing it to come to rest in an open, cylindrical wire basket below, approximately at hip level. More permanent courses were soon established in Southern California and beyond fueled by this disc-catching innovation. The time has come for the earnest professionalization of a playful form of accessible outdoor recreation. Disc golf has continued to grow in popularity—as evidenced by course installations and disc sales—without entering the mainstream. 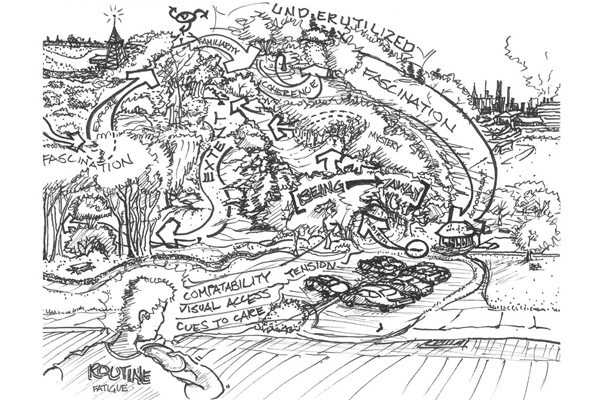 Today, it appears to be at a fulcrum point: the skill sets of landscape architecture professionals can help tip the sometimes-haphazard trajectory of this grassroots groundswell phenomenon towards wider legitimacy and broader public value. Last year, my Cal Poly Pomona MLA thesis: “Disc Golf Course Design: Inscribing Lifestyle into Underutilized Landscapes” was successfully defended, a Chatham University MLA student completed a thesis on the sport’s sustainability, and a peer-reviewed geography journal published a complete study on the growth of courses in the U.S. Interestingly—according to crowd-sourced data on DGCourseReview—more than 1,000 of the 5,500+ courses on disc golf worldwide are in other countries, especially in Scandinavia and Northern Europe where they value its provision of healthy outdoor recreation in proximity to growing urban centers on “wasted” landscapes unsuitable for other uses. The ball-golf course land bubble is crashing and their sites—rife with conflicts over water rights—are often bargains, while disc golf waits in the wings. 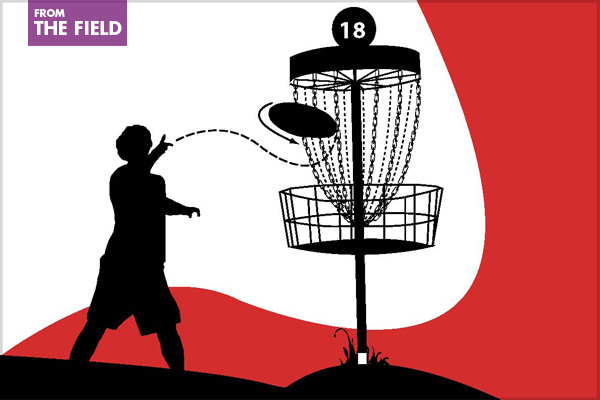 While there is much to be learned from ball-golf course design, more pay-to-play resort course destinations for disc golf and attractions at businesses such as breweries will help meet the growing demand for ‘Frolf’ alongside predominantly free public courses in the future. The untapped possibilities of permaculture principles being applied to disc golf courses through its participants is just one opportunity to be explored for this resilient phenomenon to improve the way we recreate and interact in public. 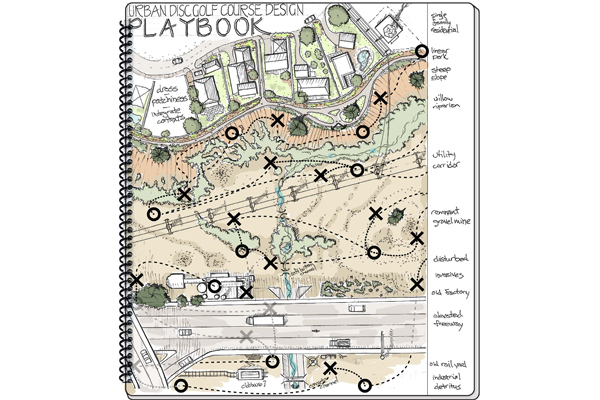 This figure from page 192 of “Disc Golf Course Design” is closely modeled on the Mountain Pride, Murrieta, CA example of urban-center disc golf courses. The original 9-hole layout at the small residential park (light green) utilized the mulched buffer area adjacent to private single family homes, which caused conflict. The 18-hole reconfiguration utilized a wash (pink) extending well west of the developed park, also owned by the City of Murrieta. The reconfiguration shifted an undesirable spatial relationship into an underutilized landscape. The abstract for my thesis is given below, along with a link for further reading and graphic illustrations of the concepts explored. While this research was grounded in Southern California, it was written so that the place-based urban and cultural patterns discussed could inform disc golf course development strategies in wide-ranging contexts. Disc golf emerged as one of several alternative lifestyle sports from the countercultural social movement of the 1960’s and its popularity has steadily grown while other postmodern recreation forms have faded or plateaued (Wheaton 2004). As an accessible, malleable form of outdoor recreation its appeal can be explained by the sense of place elicited from direct engagement with the landscape and community derived from a culture of play. This thesis identifies the landscape and cultural characteristics of disc golf that make it attractive by collecting and analyzing qualitative data directly from its participants in the Los Angeles region. Semi-structured interviews were conducted at four popular disc golf courses representing four distinct landscape typologies in order to discover motivations to play and user preferences related to landscape characteristics. Demographic results identified patterns of user responses. The results of content analysis of the transcribed interviews revealed an overall reluctance to travel for disc golf, but a desire for landscape variety. Interview respondents also expressed an overall willingness and enthusiasm to play courses developed on underutilized post-industrial sites. Community and camaraderie at each site was shown to be uniquely shaped by rule-creation through play forms (Callois 1961) by either leveling the playing field for newer players, or creating complexity/challenge for more experienced players. As the economy weakens, leisure demand for open space increases (Trust for Public Land 2011) and landscape architecture in academia has the opportunity to research how course growth can activate underutilized urban environments. 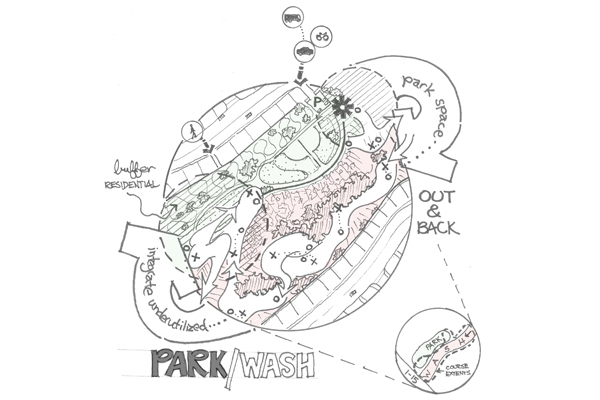 With new understanding about subculture and course typologies, designers can apply knowledge of disc golf as a unique form of recreation to steer its evolution as a component of multi-functional urban environments. Guidelines and recommendations are given. To read more about the disc golf revolution, visit LuLu.com.